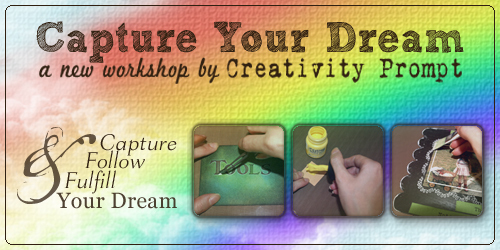 The duration of the workshop is 6 weeks (5 lessons per week). That's 30 lessons delivered right to your inbox!!! Q: The workshop is pretty intensive what if I'm too busy for 5 lessons per week? OR I'm going on vacation soon and would miss some of the lessons. Q: Will there be a special forum for the workshop's members? I'd like to connect with other members. A: Absolutely. The workshop is going to have a private forum for its members and you are welcome to participate in it, ask questions, communicate with other members, share thoughts and even include links to your workshop related work. I will be active on this forum too. Q: What if I don't like the workshop? "Sad not to be getting any more of your e-mails. I am still working on my mini album and will let you know when I post on my blog. Just wanted to let you know that I learned a lot of new techniques from your course. I don't like to sew, so I adapted those parts and did with paper instead. Also, I feel like I now have an organized plan for my dream which is one of the most difficult parts to do. Sometimes you just don't know how to actually begin to do something. Putting it down on paper helped me a lot." "It was wonderful and I recommend it to EVERYONE! You are fantastic … always quick with a kind word … and help! Thanks so much!" "Today I was looking through my childhood memories when my 12 year old daughter joined me. It was so nice to share these memories and my dreams with her. A wonderful side effect of the workshop!" This entry was written by Angie and posted on January 12, 2010 at 5:00 am	and filed under Classes, Scrapbooking, scrapscene. Bookmark the permalink. Follow any comments here with the RSS feed for this post. Post a comment or leave a trackback: Trackback URL.